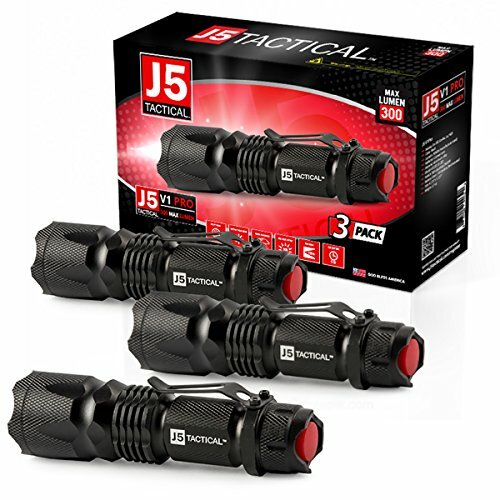 It's official the J5 Tactical V1-Pro Flashlight is J5 Tactical's best-selling flashlight from the J5 range. With its ultra-bright LED light, and ability to run for hours of just a single AA Battery. This flashlight represents the best value in the J5 Tactical Family. "Remember those big MagLights that took 4 D Cell Batteries? Well this mini tactical Flashlight using only a single AA Battery, simply blows it out of the water." - A recently returned serviceman told us he used his J5 Tactical in Afghanistan and upon return gave it too his Dad because he liked it so much. If you have any problems whatsoever with your purchase, simply contact J5 Tactical & it will be taken care of. INTELLIGENT - High / Low / Strobe Modes Means You Will be Ready For Anything That Comes Your Way. EFFICIENT - Runs Off a Single AA Battery or a 14500 Rechargeable (not included) & gives hours of use. SATISFACTION 100% GUARANTEED - If you don't absolutely love your J5 Tactical Flashlight or if there are any issues with it at all, We will replace or refund your purchase, no worries at all. We want you to be 100% happy with your new flashlight. If you have any questions about this product by J5 Tactical, contact us by completing and submitting the form below. If you are looking for a specif part number, please include it with your message.